Stuffed or plush animals are often found on the list of childhood toys that create the most memories. If you were lucky enough to have a favorite stuffed or plush animals today is your day. It is Plush animal Lovers Day it is a day of celebration that allows us to share about our best friend when we were children. Our best friend that knew all the secrets but were not really alive to be able to repeat what was told to them. 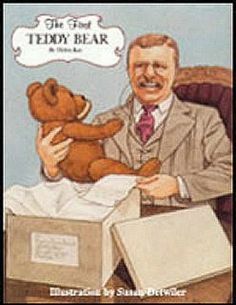 President Teddy Roosevelt had a famous plush animals, the teddy bear named after him. It was while on a hunting trip that the President saw a baby bear and refused to shoot it. The story as they often do was retold several times and resulted in the naming of the teddy bear. Now days plush animals of a great variety are found in lots of places. Royal Selangor the inventor of the Plush Animals Lovers Day most likely had a vast variety himself. In the late 80s Royal hosted a Teddy Bear Picnic Day. It was after these picnics when it was found that other stuffed animals were getting jealous as Teddy Bears were getting all the respect and being singled out. So that other animals could join the picnic the Teddy Bears Picnic Day was replaced by Plush Animal Lovers Day. Today take your plush animal with you. Take them with you where ever you go to the office, school, or work place. After all a stuffed toy is a life time friend not just during Christmas season. When I hear the word bandana a few different things come to mind. My daddy who would carry one with him, my friends who wear them around their heads, legs or elsewhere to show a relationship to the world they live in and I also think of cancer and my little friend who never grew up who wore a bandanana when she lost her hair. Today, is International Bandana Day and people every where will find a reason to connect to bandanans. In the year 2012 there was 14.1 million new cases of Cancer world-wide. This number in no way shows a connection to individuals who have been affected over the years by this terrible vicious disease of Cancer. Bandana day came about when teens in Australia wanted to raise awareness and support for young people living with cancer. Bandanas are often used by individuals being treated for cancer using the treatment of chemo. The treatment helps fight cancer using drugs that are very powerful that cause many side affects. One side affect is hair loss and bandanas are used to try to cover up the hairloss. Bandanas can appear a bit stylish by those wearing them and helps keeps the spirit of those suffering with hair loss spirits up. Bandanas are often used as well to show an association with those living a certain life style. A show of solidarity with friends and those in that life style as well. The same color of bandana gives it even more style and effect. Those suffering with cancer depend on the support of others to give them the attitude to fight. Today, don a bandana and show your support as well. There are organizations that will be selling bandanas to help raise support as well. Purchase one of these if possible and wear it to show solidarity. The thing is to get other to talk so that you can encourage them to support and donate as well to cancer research. 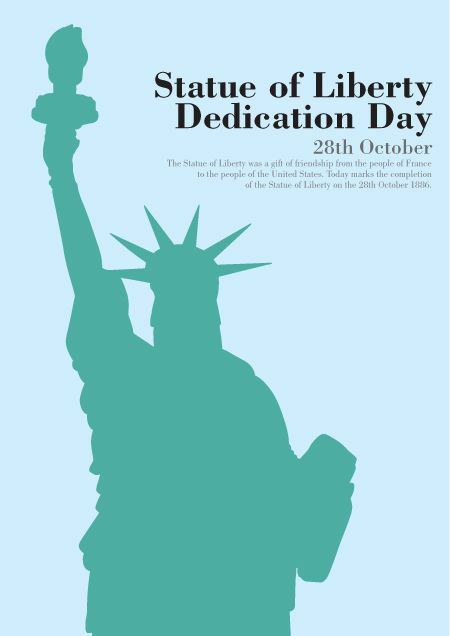 Statue of Liberty Dedication Day is held every year on October 28th. The Statue of Liberty was gifted from the French to the U.S. in 1886. It came during the centennial of the signing of the U.S. Declaration of Independence. The Statue of Liberty stands as an example of the bond of friendship between the U.S. and France. One of my dearest childhood memories is the hometown parade during the 4th of July. Each year a dear friend of my mothers would be part of the parade as she stood straight and tall representing the Statue of Liberty. The crowds of individuals that this touched when the lady recently passed she was remember in her obituary for that very action. The horror character Frankenstein dates back to the 1800's. 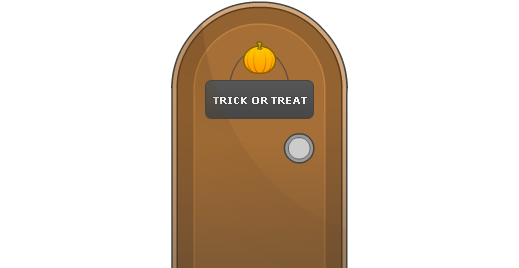 He is one of the best known characters that often appears around Halloween. 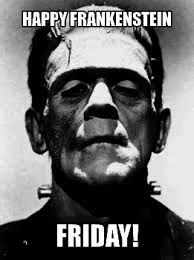 Frankenstein Friday occurs on the last Friday of October and celebrates the birth of Frankenstein and his creator. Frankenstein was created by Marry Wollenstonecraft Shelley the author of the book Frankenstein Today would be a great time to read the novel or watch the movie Frankenstein. Unroll a tube of refrigerated breadsticks we used an 11-ounce tube to make 12 bones) and separate the rectangular pieces. Working with one piece at a time, stretch the dough to lengthen it a bit and then use kitchen scissors or a knife to cut a 1-inch slit in the center of each end. Shape the resulting four flaps of dough into knobs that look like the ends of a bone. Place the dough bones on an ungreased baking sheet, spacing them a few inches apart, and sprinkle on a little coarse salt. Bake the bones at 375° until they are light golden brown, about 12 minutes. 1. Slice apples into thin slices. Melt coconut oil in a large pan on the stove. Add the apples to the pan, generously season with cinnamon, cover and cook over medium heat for about 10-15 minutes, stirring occasionally. Cook until soft and slightly browned (you can add coconut sap crystals to the apples if you want them to be sweeter, but it isn't necassary). Meanwhile, make your pork chops. 2. Pre-heat BBQ to medium-high temperature. Brush the pork chops on both sides with the melted butter. Rub each side of the pork chops with equal parts cinnamon and coconut sap crystals. 3. Cook pork chops for approx 5 minutes on each side on the BBQ. 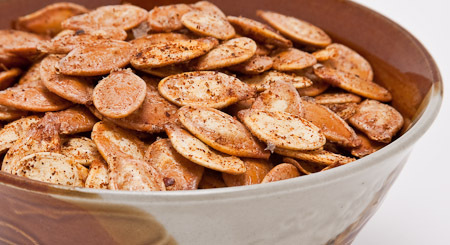 Remove from BBQ, top with cinnamon apples and enjoy! In the top of a double-boiler, or in a metal bowl set over a pot of barely simmering water, melt the bittersweet and unsweetened chocolates, stirring, until smooth. Add butter and vanilla and stir to incorporate. Remove from the heat. In a bowl, beat the egg yolks. In a medium, heavy saucepan, whisk together the sugar, cornstarch, and salt. Add the milk in a stream, whisking constantly. Bring the mixture to a boil, whisking constantly to keep lumps from forming. Remove from the heat. Add 1 cup of the hot milk mixture to the yolks and whisk until smooth. Add the beaten yolk mixture to the saucepan with the hot milk and bring to a simmer over medium-low heat. Simmer, whisking constantly, until thick and smooth, about 3 minutes. Remove from the heat and whisk in the melted chocolate mixture. Transfer to a large bowl. Cover with plastic wrap, pressing down on the surface to prevent a skin from forming, and refrigerate to cool. In a medium bowl, whip the cream until soft peaks start to form. Add the confectioners' sugar and continue beating until stiff peaks start to form. Fold half of the whipped cream and most of the crushed cookies into the cooled pudding mixture. Spoon into a 9-inch square glass baking dish. Sprinkle with the remaining cookies. Spoon the remaining whipped cream in blobs on the top for "ghosts" and garnish with gummy worms, slightly poking them down into the surface. Serve immediately, or refrigerate until ready to serve. My grand-children play as hard as my children did. My grand-daughter recently being named co-captain and goalie of her soccer team. With her involved in so many great sports, riding bikes and just being out going we have had our share of ice packs. So out of necessity we have started to create our own ice packs to keep on hand. Mix the two together in a gallon size ziploc. Freeze and while the ice pack will be ice cold the alcohol will allow the liquid to smush up and move around. Not freezing solid helps to keep the ice pack usable. The next best thing to this is a bag of frozen peas. you can break the peas apart and then it will conform to where you need it to. We have reached that haunting month where lots of fun things will be happening. At the end of the month your neighborhood if it is like mine will be crawling with little monsters and other characters. It can be a fun night if a few simple rules are followed. Before heading out for a night of fun make sure that you have a bit to eat. If the belly is full then they will be less tempted to eat candy. Bring along some sort of light. This may be a flashlight, reflective wear or some other form of light. One thing that happens in the dark is tripping so if the path is lit the little goblins can get around easier. Stay in an area that you know well. 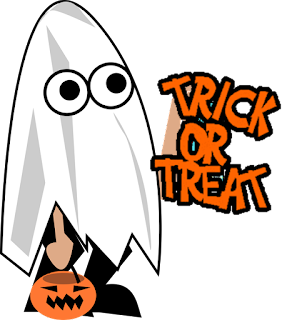 Take your children trick or treating and do it as a family event. The route should be well lit as well. Great time to talk to neighbors and introduce your children to your adult friends as well. Take your time have a relaxing night and most of all fun. Preheat your oven to 425 degrees F. Grease a pizza pan with nonstick cooking spray. Roll out the crust on a floured surface with a floured rolling pin to about 1/4-inch thickness. Spread the pizza sauce over the crust until it's fully covered. Bake the crust for about 8 - 10 minutes, or until the crust is golden brown. Slice the fresh mozzarella. Using a ghost cookie cutter cut out some ghost shapes. 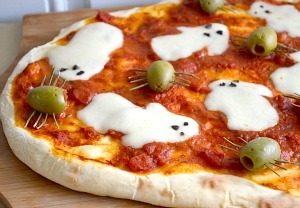 Place the ghosts on top of the pizza sauce. 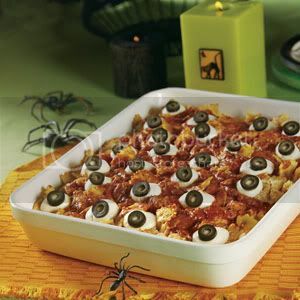 Using the finely chopped olives, place eyes on the head of the ghosts. Bake the pizza for about 5 - 6 minutes, or until the cheese is fully melted. Once the pizza is baked, make spiders by sticking the rosemary leaves into the green olives. Place the spiders next to the ghosts and serve. 1. Create an outline for your pumpkin by laying some of the carrots out in an oblong circle. Once the carrot outline is to your liking, carefully fill in the circle with the rest of the carrots. 2. Remove enough of the carrots to create a cucumber-filled smile. Set the carrots you removed on top of the other carrots within your pumpkin. 3. Place halved cucumber slices in the space you created for your carrot pumpkin's smile. 4. 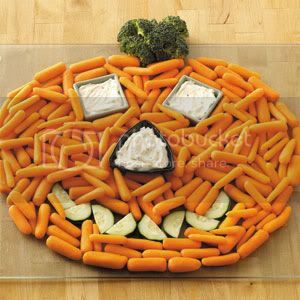 Fill your ramekins with the veggie dip and shimmy them into place where you want the pumpkin's eyes and nose to be. 5. Slice off the stem of the broccoli head. Place the broccoli at the top of your pumpkin. 1. Spray a 13 x 9 x 2-inch shallow baking dish with the cooking spray. 2. 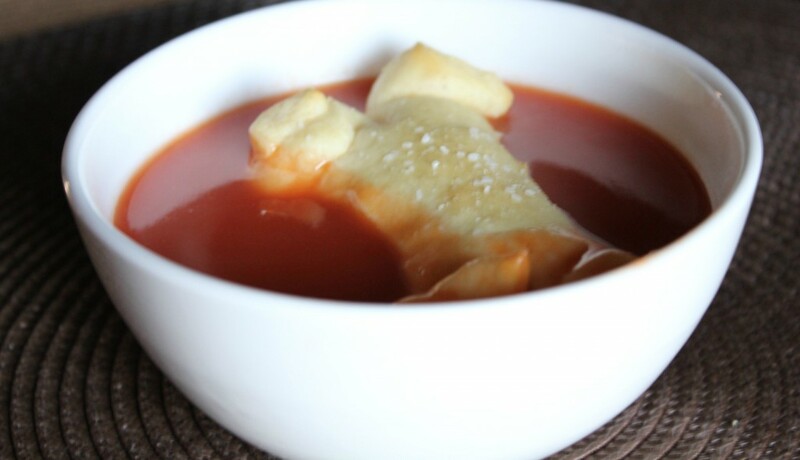 Mix 1 1/2 cups pasta sauce, ricotta cheese, 1/2 cup Parmesan cheese and pasta in the prepared dish. Spread the remaining pasta sauce over the pasta mixture. Sprinkle with the remaining Parmesan cheese and cover with foil. 3. Bake at 400°F. for 25 min. or until hot. Arrange the cheese balls randomly over the pasta mixture. Place a sliced olive on each cheese ball. Let stand for 10 min. before serving. * Easy Substitution: If fresh mozzarella cheese balls are not available, substitute 1 package (8 oz.) fresh mozzarella cheese. Cut crosswise into thirds. Cut each third in 6 wedges, for triangle-shaped eyes. In the bowl of a food processor place flour, salt, pepper (optional if your little ghouls don't like any spice), and the cheese, pulse one or two times. Add butter and pulse a couple more times until mixture is looking crumbly. Add chives and sour cream and pulse until the mixture is starting to ball up. I used fontina cheese, but parmesan or white cheddar would also work well. Place cracker dough in a covered bowl and refrigerate for 20 minutes. On a lightly floured surface roll dough to 1/4" thick and cut out with small ghost shaped cutter and place them 1/2" apart on a baking sheet lined with parchment or a silpat. Place two black sesame seeds for eyes and one for the mouth. I love mini cutter sets such as these, your local craft store is a good source too. 2. SHAPE into 40 (1-inch) balls. Dip balls in melted chocolate; roll in sugar to evenly coat. Place in single layer in shallow waxed paper-lined pan. 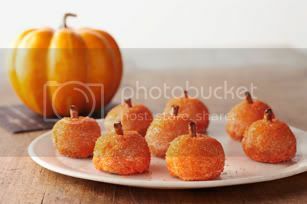 Insert 1 pretzel piece into top of each for the pumpkin's stem. How to Easily Dip Cookie Balls - To easily coat cookie balls with the melted chocolate, add balls, in batches, to bowl of melted chocolate. Use 2 forks to roll balls in chocolate until evenly coated. Remove balls with forks, letting excess chocolate drip back into bowl. Place balls in prepared pan; let stand until chocolate coating is firm. October 25th is the day for Chucky movie fans every where to enjoy. The horror of such a day for those that do not care for Chucky is terrible. One great way to celebrate this terrifying day is to host a Chucky Movie Marathon. There are several Chucky films so make a day of it. 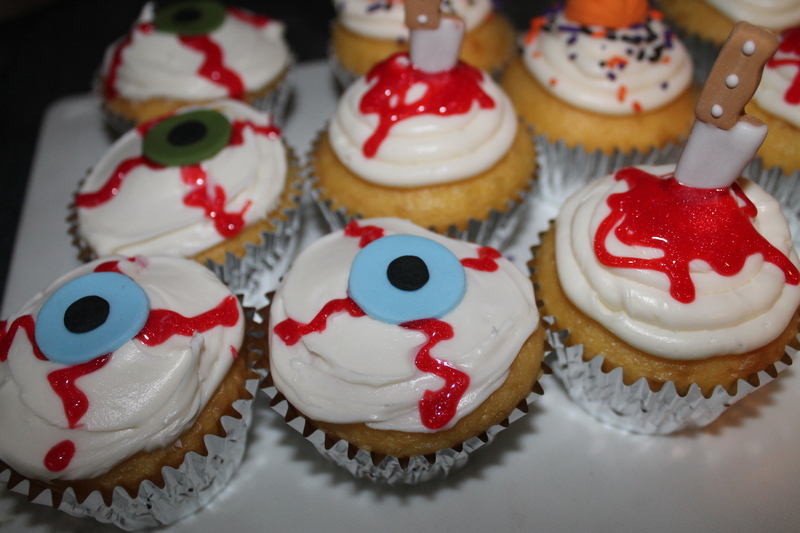 Watch the frightening Child's Play films and enjoy a specially made Chucky Themed Cake. My daughter in law is terrified of Chucky and my son has a chucky doll that he loves to scare her with. This is the day to do that on as those that love Chucky will be trying to scare those who do not like him or are scared of him. Do you like Chucky?? Will You be hiding or celebrating?? Wash, halve, and core the apples. Line a baking pan with aluminum foil. In a small mixing bowl, combine the oil, liquid stevia, vanilla, cinnamon and allspice. Pour this mixture into the pan with the aluminum foil. Place the apples face down/skin up on the foil and oil (ha – foil and oil). Place the pan in the oven and leave it in for 20 minutes. At the 20 minute mark, you guessed it, turn the apples over! I spooned additional mixture onto the apples as well, to better soak it all up. Bake for an additional 15 minutes. Let them cool for a while before removing them from the pan. They’re best when they’re eaten warm from the oven though. Heat oven to 300° F. Remove the seeds from the pumpkins. Discard the pulp. Spread the seeds (no need to rinse them) evenly on an ungreased baking sheet. Bakeuntil dried, about 1 hour. Toss the seeds, olive oil, celery salt, and cumin in a large skillet. Cook, stirring occasionally, over medium heat, until the seeds are lightly toasted, about 3 minutes. 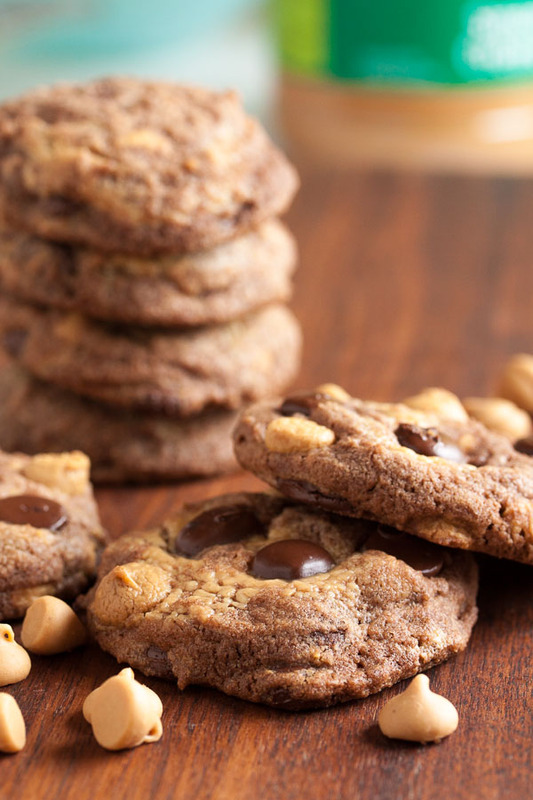 Adapted from "Chocolate-Peanut Butter Cookies" from Tina Casaceli's Milk & Cookies. The recipe says it will make 2 dozen cookies (ha!) – I got 82 using my usual slightly larger than tablespoon-sized cookie scoop. Turn the mixer down to low and add the dry ingredients, mixing until just barely combined. Remove from the mixer and add in the chocolate chips and peanut butter chips, either with a spatula or by hand. I prefer to knead inclusions in by hand to ensure they're distributed evenly. Add the peanut butter and just fold it in gently. Don't mix it completely – you want to keep streaks and blobs of peanut butter throughout your dough. Bake for about 16-18 minutes, rotating the baking sheet halfway through the baking time. Allow to cool on a wire rack for a few minutes before removing the cookies from the pan and allowing them to cool completely. It's that time again. The time for a bit of fear whether real or pretend it is scary and fun all at the same time. There are some fears that are not fun though and a bit scary as well. One of those fears is having someone you love spend eternity in the fiery pit known as Hell. That is why every year at the same time when everyone is going about the world saying "Boo" our church takes its time to spread the message so that noone will be seperated for eternity from those that they love. Judgement House helps share the story through a series of scenes of life. It plays out in front of groups of 20 or so at a time. The scenes will tell a story that will share the story of both Heaven and Hell and how the destination of each was reached. While not a haunted house as in the aspect of monsters and witches but yet the scenes could and should be frightening and enlightening at the same time. In the blink of an eye the life of a mother, father, child or best friend could be changed forever. The story demonstrated should make every single person think and the scenes of hell and Heaven should be a testification. Do you know where you will send eternity will it be Heaven or Hell?? Do you know for sure?? If you visit judgement house you will find out why it is so important to know for sure. You have to know what you know that you know. Sometimes the job of a mom is hard and we are not always the favorite of our children. One department this is true in is what our children should be eating. There are also a few adults I know that could use a bit of help preparing nutritional diet as well. The U.S. Department of Agriculture advises that children should eat five fruits and vegetables a day. One tip is to leave a bowl of fruit or veggie sticks on the kitchen table to tempt children when they are looking for a treat to eat. Dips and spreads go great with fruit and veggies. Another great way to use both fruit and vegetables is to create salads. Kids often prefer small whole veggies and florets and pieces of chopped fruit. Involve your child in choosing fruits and veggies at the grocery store. Include chopped vegetables on favorite dishes like pizza or nachos or stir into macaroni and cheese. 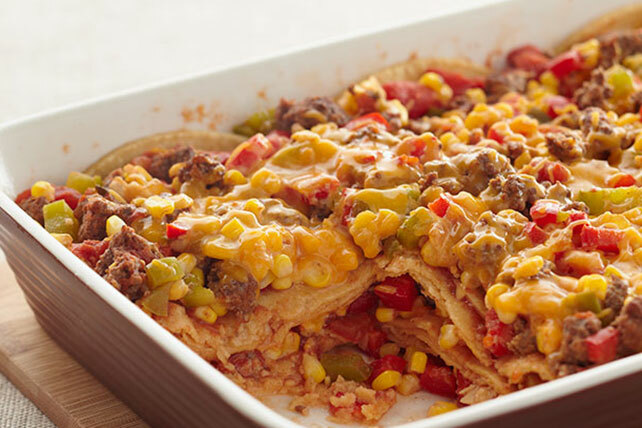 Other great dishes include meatloaf and casseroles like shepherd pie. Wash and dry the lettuce, tomato, cucumber, and red pepper. Open the bags of shredded carrots and shredded cheese. Cut the tomato, cucumber, and red pepper into small pieces. Cut the avocado open and remove the pit. Scoop out the insides into the bowl. Mash up the avocado with the spoon. Use the spoon to spread some avocado on a lettuce leaf. Sprinkle carrots on the avocado. Sprinkle tomatoes, cucumber, and red pepper over the carrots. Sprinkle cheese over the vegetables. Fold the sides of the lettuce over the vegetables and cheese. Ask an adult to help you. These little lettuce boats are great for kids to help make. It helps them want to dine on veggies and gather the vitamins and minerals that help their bodies. Avocado has healthy sort of fat in it that helps vitamins work better. Cheese also has protein and helps bodies grow big and strong. Heat the oil in a 12-inch skillet over medium-high heat. Add the chicken and cook until well browned on all sides. Stir the garlic, Italian seasoning, tomatoes, mushrooms, onions, pepper and 1 cup stock in a 6-quart slow cooker. Add the chicken and turn to coat. Cover and cook on LOW for 7 to 8 hours or until the chicken is cooked through. Remove the chicken from the cooker and keep warm. Stir the cornstarch and remaining stock in a small bowl until the mixture is smooth. Stir the cornstarch mixture in the cooker. Cover and cook on HIGH for 10 minutes or until the mixture boils and thickens. Serve with the chicken and pappardelle. Easily change up the holidays by adding different candies for the season. Candy corn topping works great for Halloween bark. To make this example, start with a base of chocolate and let set. 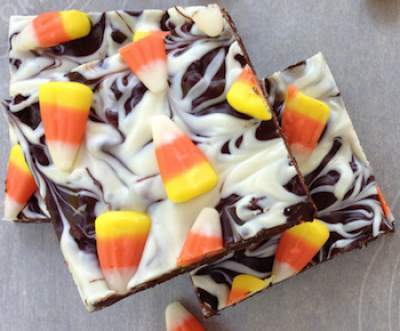 Drizzle melted white chocolate over the top and press candy corn on top. Let set. 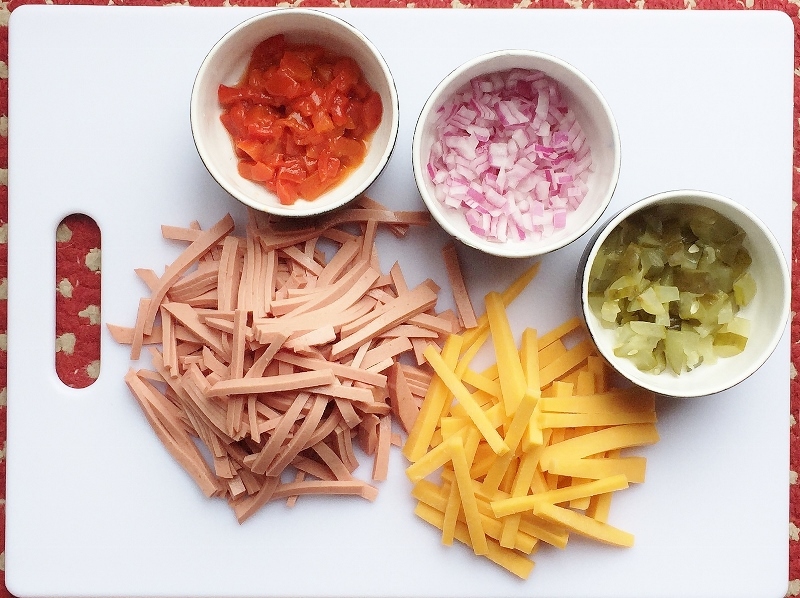 Bologna or "Baloney" as it may be referred to is the makings of a delicious sandwich. Bologna is a sausage that is commonly used as luncheon meat. Bologna comes in a variety of choices. German Bologna that my grandparents preferred may also be called garlic bologna. It often has more garlic seasoning than regular bologna would have. Beef Bologna is normally redder in color than regular bologna. Beef bologna is only made with beef products. and these are just 4 of the most common. Bologna could include pork, beef, chicken and spices. 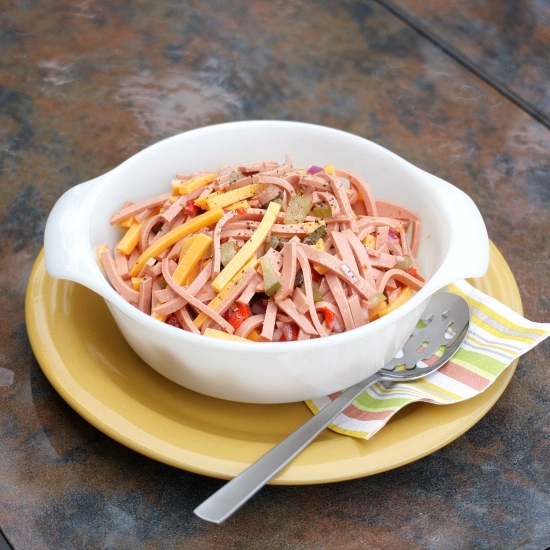 This recipe for bologna salad will make up about 5 cups of salad. It is very easy to make and only takes about 15 minutes to prepare. 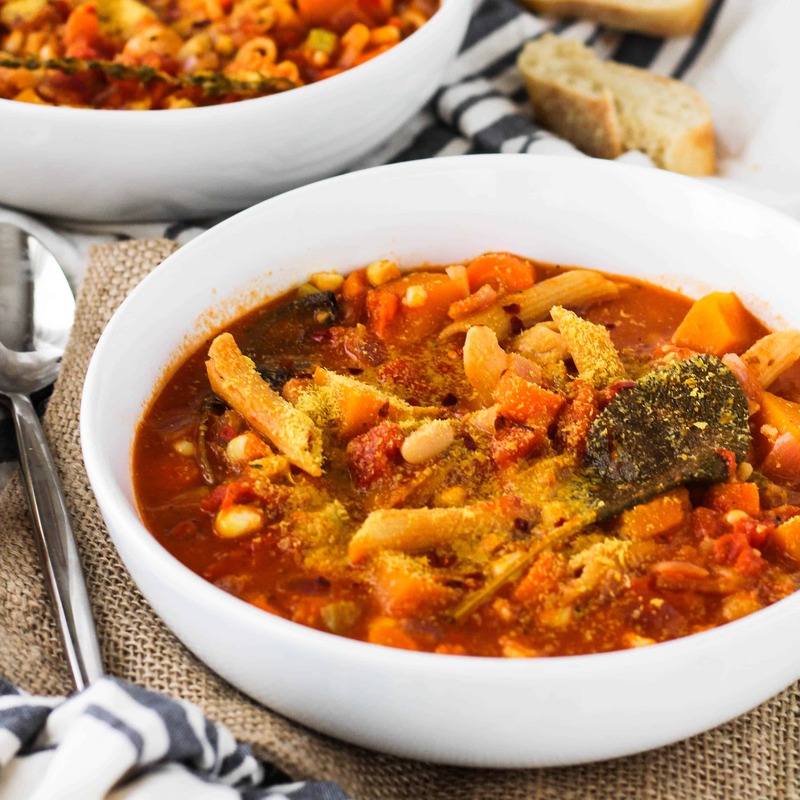 Toss all ingredients together and serve immediately with crusty bread or as a side at BBQ’s. As a variation if you don’t like the amount of bologna in the dish, try mixing cold cuts such as hard salami, sliced chicken or turkey along with bologna. I guarantee, if you have a savory taste, you’ll love it!